These highlights do not include all the information needed to use ONFI safely and effectively. See full prescribing information for ONFI. To report SUSPECTED ADVERSE REACTIONS, contact Lundbeck at 1-800-455-1141 or FDA at 1-800-FDA-1088 or www.fda.gov/medwatch. ONFI® (clobazam) is indicated for the adjunctive treatment of seizures associated with Lennox-Gastaut syndrome (LGS) in patients 2 years of age or older. A daily dose of ONFI greater than 5 mg should be administered in divided doses twice daily; a 5 mg daily dose can be administered as a single dose. Dose patients according to body weight. Individualize dosing within each body weight group, based on clinical efficacy and tolerability. Each dose in Table 1 (e.g., 5 to 20 mg in ≤30 kg weight group) has been shown to be effective, although effectiveness increases with increasing dose [see Clinical Studies (14)]. Do not proceed with dose escalation more rapidly than weekly, because serum concentrations of clobazam and its active metabolite require 5 and 9 days, respectively, to reach steady-state. As with all antiepileptic drugs and benzodiazepines, withdraw ONFI gradually. Taper by decreasing the total daily dose by 5-10 mg/day on a weekly basis until discontinued [see Warnings and Precautions (5.4)]. Instruct patients to read the "Instructions for Use" carefully for complete directions on how to properly dose and administer ONFI oral suspension. ONFI tablets can be taken with or without food. ONFI tablets can be administered whole, broken in half along the score, or crushed and mixed in applesauce. ONFI oral suspension can be taken with or without food [see Clinical Pharmacology (12.3)]. Shake ONFI Oral Suspension well before every administration. 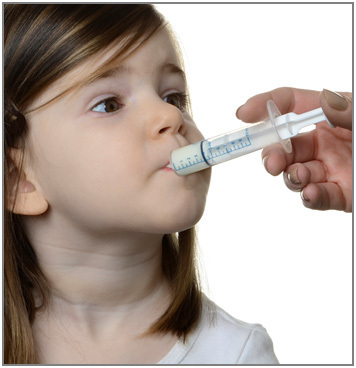 When administering the oral suspension, use only the oral dosing syringe provided with the product. Each carton includes two syringes, but only one syringe should be used for dosing. The second oral syringe is reserved as a replacement in case the first syringe is damaged or lost. 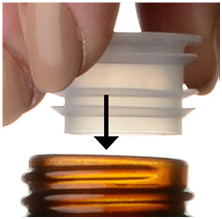 Insert the provided adapter firmly into the neck of the bottle before first use and keep the adapter in place for the duration of the usage of the bottle. 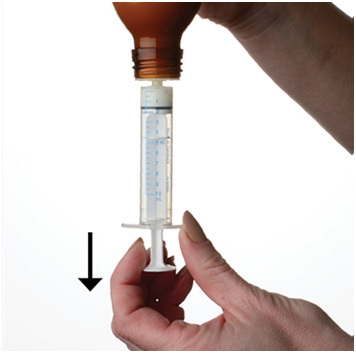 To withdraw the dose, insert the dosing syringe into the adapter and invert the bottle then slowly pull back the plunger to prescribed dose. After removing the syringe from the bottle adapter, slowly squirt ONFI Oral Suspension into the corner of the patient's mouth. Replace the cap after each use. The cap fits over the adapter when the adapter is properly placed. 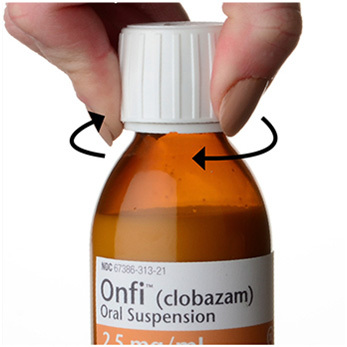 See ONFI Oral Suspension "Instructions for Use" for complete instruction on how to properly dose and administer the ONFI Oral Suspension. No dose adjustment is required for patients with mild and moderate renal impairment. There is no experience with ONFI in patients with severe renal impairment or end stage renal disease (ESRD). It is not known if clobazam or its active metabolite, N-desmethylclobazam, is dialyzable [see Use in Specific Populations (8.7), Clinical Pharmacology (12.3)]. ONFI is hepatically metabolized; however, there are limited data to characterize the effect of hepatic impairment on the pharmacokinetics of ONFI. For this reason, proceed slowly with dosing escalations. For patients with mild to moderate hepatic impairment (Child-Pugh score 5-9), the starting dose should be 5 mg/day in both weight groups. Then titrate patients according to weight, but to half the dose presented in Table 1, as tolerated. If necessary and based upon clinical response, start an additional titration on day 21 to the maximum dose (20 mg/day or 40 mg/day, depending on the weight group). There is inadequate information about metabolism of ONFI in patients with severe hepatic impairment. Therefore no dosing recommendation in those patients can be given [see Use in Specific Populations (8.8), Clinical Pharmacology (12.3)]. Tablets: 10 mg and 20 mg with a functional score for oral administration. Each ONFI tablet is a white to off-white, oval tablet with a functional score on one side and either a "1" and "0" or a "2" and "0" debossed on the other side. Oral Suspension: 2.5 mg/mL for oral administration. Each bottle contains 120 mL of an off-white suspension. ONFI is contraindicated in patients with a history of hypersensitivity to the drug or its ingredients. Hypersensitivity reactions have included serious dermatological reactions [see Warnings and Precautions (5.5)]. Concomitant use of benzodiazepines, including ONFI, and opioids may result in profound sedation, respiratory depression, coma, and death. Because of these risks, reserve concomitant prescribing of benzodiazepines and opioids for use in patients for whom alternative treatment options are inadequate. Observational studies have demonstrated that concomitant use of opioid analgesics and benzodiazepines increases the risk of drug-related mortality compared to use of opioids alone. If a decision is made to prescribe ONFI concomitantly with opioids, prescribe the lowest effective dosages and minimum durations of concomitant use, and follow patients closely for signs and symptoms of respiratory depression and sedation. Advise both patients and caregivers about the risks of respiratory depression and sedation when ONFI is used with opioids [see Drug Interactions (7.1)]. 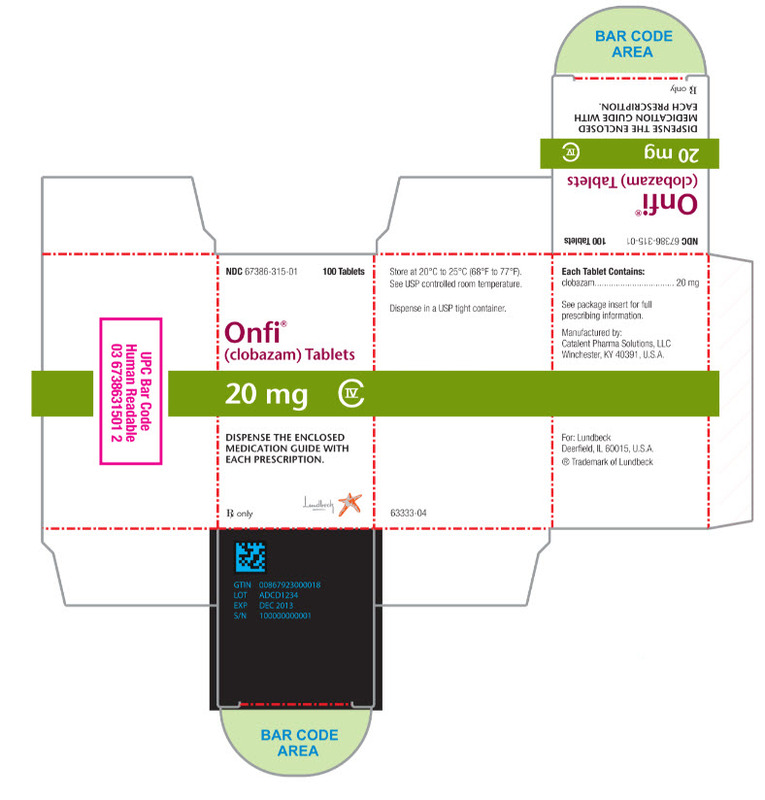 Since ONFI has a central nervous system (CNS) depressant effect, patients or their caregivers should be cautioned against simultaneous use with other CNS depressant drugs or alcohol, and cautioned that the effects of other CNS depressant drugs or alcohol may be potentiated [see Drug Interactions (7.2)]. ONFI causes somnolence and sedation. In clinical trials, somnolence or sedation was reported at all effective doses and was dose-related. In general, somnolence and sedation begin within the first month of treatment and may diminish with continued treatment. Prescribers should monitor patients for somnolence and sedation, particularly with concomitant use of other central nervous system depressants. Prescribers should caution patients against engaging in hazardous activities requiring mental alertness, such as operating dangerous machinery or motor vehicles, until the effect of ONFI is known. Abrupt discontinuation of ONFI should be avoided. ONFI should be tapered by decreasing the dose every week by 5-10 mg/day until discontinuation [see Dosage and Administration (2.2)]. Withdrawal symptoms occurred following abrupt discontinuation of ONFI; the risk of withdrawal symptoms is greater with higher doses. As with all antiepileptic drugs, ONFI should be withdrawn gradually to minimize the risk of precipitating seizures, seizure exacerbation, or status epilepticus. Serious skin reactions, including Stevens-Johnson syndrome (SJS) and toxic epidermal necrolysis (TEN), have been reported with ONFI in both children and adults during the postmarketing period. Patients should be closely monitored for signs or symptoms of SJS/TEN, especially during the first 8 weeks of treatment initiation or when re-introducing therapy. ONFI should be discontinued at the first sign of rash, unless the rash is clearly not drug-related. If signs or symptoms suggest SJS/TEN, use of this drug should not be resumed and alternative therapy should be considered [see Contraindications (4)]. Patients with a history of substance abuse should be under careful surveillance when receiving ONFI or other psychotropic agents because of the predisposition of such patients to habituation and dependence [see Drug Abuse and Dependence (9)]. Antiepileptic drugs (AEDs), including ONFI, increase the risk of suicidal thoughts or behavior in patients taking these drugs for any indication. Patients treated with any AED for any indication should be monitored for the emergence or worsening of depression, suicidal thoughts or behavior, and/or any unusual changes in mood or behavior. Anyone considering prescribing ONFI or any other AED must balance the risk of suicidal thoughts or behavior with the risk of untreated illness. Epilepsy and many other illnesses for which AEDs are prescribed are themselves associated with morbidity and mortality and an increased risk of suicidal thoughts and behavior. Should suicidal thoughts and behavior emerge during treatment, the prescriber needs to consider whether the emergence of these symptoms in any given patient may be related to the illness being treated. During its development for the adjunctive treatment of seizures associated with LGS, ONFI was administered to 333 healthy volunteers and 300 patients with a current or prior diagnosis of LGS, including 197 patients treated for 12 months or more. The conditions and duration of exposure varied greatly and included single- and multiple-dose clinical pharmacology studies in healthy volunteers and two double-blind studies in patients with LGS (Study 1 and 2) [see Clinical Studies (14)]. Only Study 1 included a placebo group, allowing comparison of adverse reaction rates on ONFI at several doses to placebo. The adverse reactions associated with ONFI treatment discontinuation in ≥1% of patients in decreasing order of frequency included lethargy, somnolence, ataxia, aggression, fatigue, and insomnia. Table 3 lists the adverse reactions that occurred in ≥5% of ONFI-treated patients (at any dose), and at a rate greater than placebo-treated patients, in the randomized, double-blind, placebo-controlled, parallel group clinical study of adjunctive AED therapy for 15 weeks (Study 1). Concomitant use of ONFI with other CNS depressants may increase the risk of sedation and somnolence [see Warnings and Precautions (5.2)]. Alcohol, as a CNS depressant, will interact with ONFI in a similar way and also increases clobazam's maximum plasma exposure by approximately 50%. Therefore, caution patients or their caregivers against simultaneous use with other CNS depressant drugs or alcohol, and caution that the effects of other CNS depressant drugs or alcohol may be potentiated [see Warnings and Precautions (5.2)]. ONFI is a weak CYP3A4 inducer. As some hormonal contraceptives are metabolized by CYP3A4, their effectiveness may be diminished when given with ONFI. Additional non-hormonal forms of contraception are recommended when using ONFI [see Clinical Pharmacology (12.3), Patient Counseling Information (17)]. 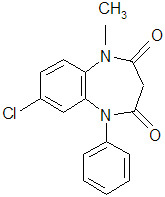 ONFI inhibits CYP2D6. Dose adjustment of drugs metabolized by CYP2D6 may be necessary [see Clinical Pharmacology (12.3)]. Strong and moderate inhibitors of CYP2C19 may result in increased exposure to N-desmethylclobazam, the active metabolite of clobazam. This may increase the risk of dose-related adverse reactions. Dosage adjustment of ONFI may be necessary when co-administered with strong CYP2C19 inhibitors (e.g., fluconazole, fluvoxamine, ticlopidine) or moderate CYP2C19 inhibitors (e.g., omeprazole) [see Clinical Pharmacology (12.3)]. There is a pregnancy exposure registry that monitors pregnancy outcomes in women exposed to AEDs, such as ONFI, during pregnancy. Physicians are advised to recommend that pregnant patients taking ONFI enroll in the North American Antiepileptic Drug (NAAED) Pregnancy Registry. This can be done by calling the toll-free number 1-888-233-2334, and must be done by patients themselves. Information on the registry can also be found at the website http://www.aedpregnancyregistry.org/. There are no adequate and well-controlled studies of ONFI in pregnant women. Available data suggest that the class of benzodiazepines is not associated with marked increases in risk for congenital anomalies. Although some early epidemiological studies suggested a relationship between benzodiazepine drug use in pregnancy and congenital anomalies such as cleft lip and or palate, these studies had considerable limitations. More recently completed studies of benzodiazepine use in pregnancy have not consistently documented elevated risks for specific congenital anomalies. There is insufficient evidence to assess the effect of benzodiazepine pregnancy exposure on neurodevelopment. There are clinical considerations regarding exposure to benzodiazepines during the second and third trimester of pregnancy or immediately prior to or during childbirth. These risks include decreased fetal movement and/or fetal heart rate variability, “floppy infant syndrome,” dependence, and withdrawal [see Clinical Considerations and Human Data]. Administration of clobazam to pregnant rats and rabbits during the period of organogenesis or to rats throughout pregnancy and lactation resulted in developmental toxicity, including increased incidences of fetal malformations and mortality, at plasma exposures for clobazam and its major active metabolite, N-desmethylclobazam, below those expected at therapeutic doses in patients [see Animal Data]. Data for other benzodiazepines suggest the possibility of long-term effects on neurobehavioral and immunological function in animals following prenatal exposure to benzodiazepines at clinically relevant doses. ONFI should be used during pregnancy only if the potential benefit to the mother justifies the potential risk to the fetus. Advise a pregnant woman and women of childbearing age of the potential risk to a fetus. Infants born to mothers who have taken benzodiazepines during the later stages of pregnancy can develop dependence, and subsequently withdrawal, during the postnatal period. Clinical manifestations of withdrawal or neonatal abstinence syndrome may include hypertonia, hyperreflexia, hypoventilation, irritability, tremors, diarrhea, and vomiting. These complications can appear shortly after delivery to 3 weeks after birth and persist from hours to several months depending on the degree of dependence and the pharmacokinetic profile of the benzodiazepine. Symptoms may be mild and transient or severe. Standard management for neonatal withdrawal syndrome has not yet been defined. Observe newborns who are exposed to ONFI in utero during the later stages of pregnancy for symptoms of withdrawal and manage accordingly. Administration of benzodiazepines immediately prior to or during childbirth can result in a floppy infant syndrome which is characterized by lethargy, hypothermia, hypotonia, respiratory depression, and difficulty feeding. Floppy infant syndrome occurs mainly within the first hours after birth and may last up to 14 days. Observe exposed newborns for these symptoms and manage accordingly. Although there are no adequate and well controlled studies of ONFI in pregnant women, there is information about benzodiazepines as a class. Dolovich et al. published a meta-analysis of 23 studies that examined the effects of benzodiazepine exposure during the first trimester of pregnancy. Eleven of the 23 studies included in the meta-analysis considered the use of chlordiazepoxide and diazepam and not other benzodiazepines. The authors considered case-control and cohort studies separately. The data from the cohort studies did not suggest an increased risk for major malformations (OR 0.90; 95% CI 0.61—1.35) or for oral cleft (OR 1.19; 95% CI 0.34—4.15). The data from the case-control studies suggested an association between benzodiazepines and major malformations (OR 3.01, 95% CI 1.32—6.84) and oral cleft (OR 1.79; 95% CI 1.13—2.82). The limitations of this meta-analysis included the small number of reports included in the analysis, and that most cases for analyses of both oral cleft and major malformations came from only three studies. A follow up to that meta-analysis included 3 new cohort studies that examined risk for major malformations and one study that considered cardiac malformations. The authors found no new studies with an outcome of oral clefts. After the addition of the new studies, the odds ratio for major malformations with first trimester exposure to benzodiazepines was 1.07 (95% CI 0.91—1.25). Neonatal withdrawal syndrome and symptoms suggestive of floppy infant syndrome associated with administration of ONFI during the later stages of pregnancy and peripartum period have been reported in the postmarketing experience. Findings in published scientific literature suggest that the major neonatal side effects of benzodiazepines include sedation and dependence with withdrawal signs. Data from observational studies suggest that fetal exposure to benzodiazepines is associated with the neonatal adverse events of hypotonia, respiratory problems, hypoventilation, low Apgar score, and neonatal withdrawal syndrome. ONFI is excreted in human milk. Postmarketing experience suggests that breastfed infants of mothers taking benzodiazepines, such as ONFI, may have effects of lethargy, somnolence and poor sucking. The effect of ONFI on milk production is unknown. The developmental and health benefits of breastfeeding should be considered along with the mother’s clinical need for ONFI and any potential adverse effects on the breastfed infant from ONFI or from the underlying maternal condition. If exposing a breastfed infant to ONFI, observe for any potential adverse effects. Adverse reactions such as somnolence and difficult feeding have been reported in infants during breastfeeding in postmarketing experience with ONFI. Monitor breastfed infants for possible sedation and poor sucking. Scientific literature on ONFI use during lactation is limited. After short-term administration, clobazam and N-desmethylclobazam are transferred into breast milk. Administration of clobazam to rats prior to and during mating and early gestation resulted in adverse effects on fertility and early embryonic development at plasma exposures for clobazam and its major active metabolite, N desmethylclobazam, below those in humans at the MRHD [see Nonclinical Toxicology (13.1)]. Clinical studies of ONFI did not include sufficient numbers of subjects aged 65 and over to determine whether they respond differently from younger subjects. However, elderly subjects appear to eliminate clobazam more slowly than younger subjects based on population pharmacokinetic analysis. For these reasons, the initial dose in elderly patients should be 5 mg/day. Patients should be titrated initially to 10-20 mg/day. Patients may be titrated further to a maximum daily dose of 40 mg if tolerated [see Dosage and Administration (2.4), Clinical Pharmacology (12.3)]. The pharmacokinetics of ONFI were evaluated in patients with mild and moderate renal impairment. There were no significant differences in systemic exposure (AUC and Cmax) between patients with mild or moderate renal impairment and healthy subjects. No dose adjustment is required for patients with mild and moderate renal impairment. There is essentially no experience with ONFI in patients with severe renal impairment or ESRD. It is not known if clobazam or its active metabolite, N-desmethylclobazam, is dialyzable [see Dosage and Administration (2.6), Clinical Pharmacology (12.3)]. ONFI is hepatically metabolized; however, there are limited data to characterize the effect of hepatic impairment on the pharmacokinetics of ONFI. For this reason, dosage adjustment is recommended in patients with mild to moderate hepatic impairment (Child-Pugh score 5-9). There is inadequate information about metabolism of ONFI in patients with severe hepatic impairment [see Dosage and Administration (2.7), Clinical Pharmacology (12.3)]. ONFI contains clobazam which is a Schedule IV controlled substance. 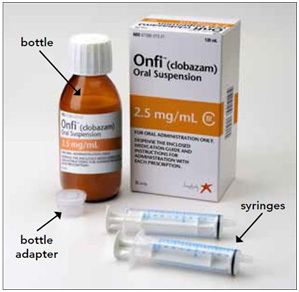 ONFI can be abused in a similar manner as other benzodiazepines, such as diazepam. The pharmacological profile of ONFI is similar to that of other benzodiazepines listed in Schedule IV of the Controlled Substance Act, particularly in its potentiation of GABAergic transmission through its action on GABAA receptors, which leads to sedation and somnolence. Physical dependence is a state of adaptation that is manifested by a specific withdrawal syndrome that can be produced by abrupt cessation, rapid dose reduction, decreasing blood levels of the drug, and/or administration of an antagonist. In clinical trials, cases of dependency were reported following abrupt discontinuation of ONFI. The risk of dependence is present even with use of ONFI at the recommended dose range over periods of only a few weeks. The risk of dependence increases with increasing dose and duration of treatment. The risk of dependence is increased in patients with a history of alcohol or drug abuse. Abrupt discontinuation of ONFI causes withdrawal symptoms. As with other benzodiazepines, ONFI should be withdrawn gradually [see Dosage and Administration (2.2), Warnings and Precautions (5.4)]. In ONFI clinical pharmacology trials in healthy volunteers, the most common withdrawal symptoms after abrupt discontinuation were headache, tremor, insomnia, anxiety, irritability, drug withdrawal syndrome, palpitations, and diarrhea [see Warnings and Precautions (5.4)]. Overdose and intoxication with benzodiazepines, including ONFI, may lead to CNS depression, associated with drowsiness, confusion and lethargy, possibly progressing to ataxia, respiratory depression, hypotension, and, rarely, coma or death. The risk of a fatal outcome is increased in cases of combined poisoning with other CNS depressants, including opioids and alcohol. 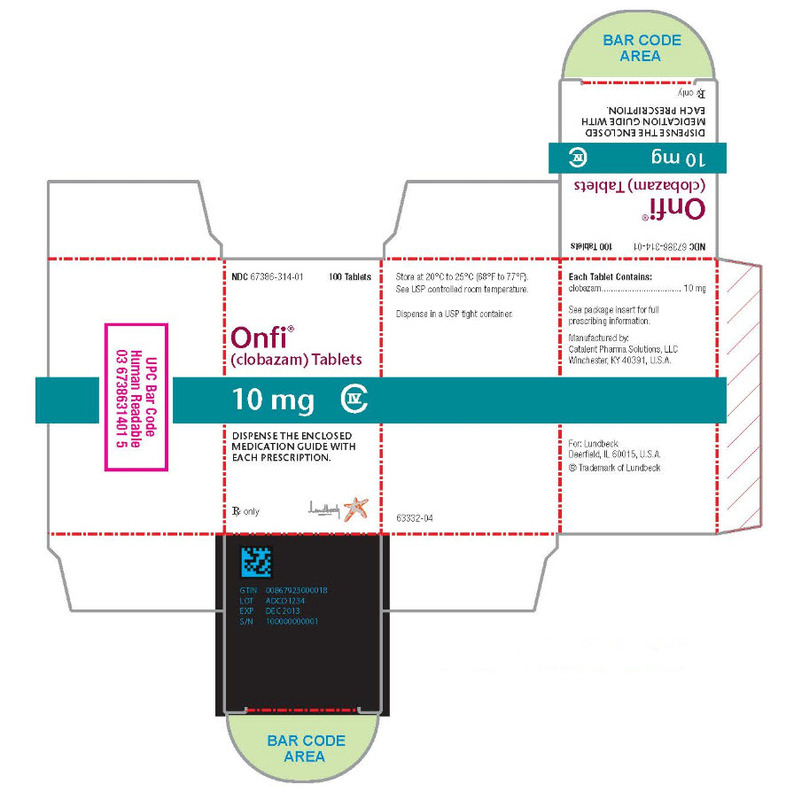 The management of ONFI overdose may include gastric lavage and/or administration of activated charcoal, intravenous fluid replenishment, early control of airway and general supportive measures, in addition to monitoring level of consciousness and vital signs. Hypotension can be treated by replenishment with plasma substitutes and, if necessary, with sympathomimetic agents. The efficacy of supplementary administration of physostigmine (a cholinergic agent) or of flumazenil (a benzodiazepine antagonist) in ONFI overdose has not been assessed. The administration of flumazenil in cases of benzodiazepine overdose can lead to withdrawal and adverse reactions. Its use in patients with epilepsy is typically not recommended. Clobazam is a white or almost white, crystalline powder with a slightly bitter taste; is slightly soluble in water, sparingly soluble in ethanol, and freely soluble in methylene chloride. The melting range of clobazam is from 182ºC to 185ºC. The molecular formula is C16H13O2N2Cl and the molecular weight is 300.7. Each ONFI tablet contains 10 mg or 20 mg of clobazam. Tablets also contain as inactive ingredients: modified corn starch, lactose monohydrate, magnesium stearate, silicon dioxide, and talc. 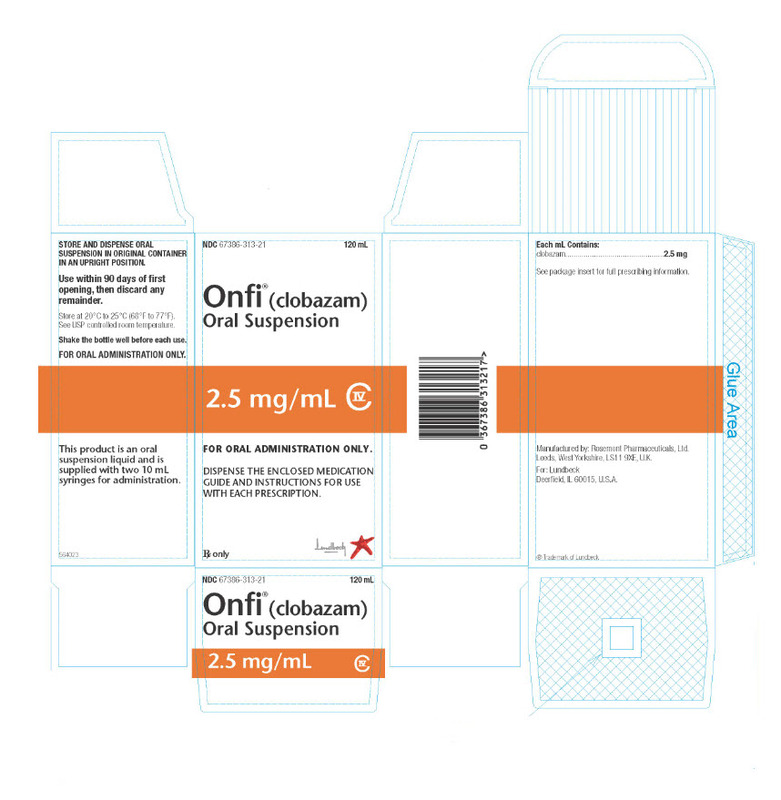 ONFI is also available for oral administration as an off-white suspension containing clobazam at a concentration of 2.5 mg/mL. Inactive ingredients include magnesium aluminum silicate, xanthan gum, citric acid monohydrate, disodium hydrogen phosphate dihydrate, simethicone emulsion, polysorbate 80, methylparaben, propylparaben, propylene glycol, sucralose, maltitol solution, berry flavor, purified water. The effect of ONFI 20 mg and 80 mg administered twice daily on QTc interval was evaluated in a randomized, evaluator-blinded, placebo-, and active-controlled (moxifloxacin 400 mg) parallel thorough QT study in 280 healthy subjects. In a study with demonstrated ability to detect small effects, the upper bound of the one-sided 95% confidence interval for the largest placebo-adjusted, baseline-corrected QTc based on the Fridericia correction method was below 10 ms, the threshold for regulatory concern. Thus, at a dose two times the maximum recommended dose, ONFI did not prolong the QTc interval to any clinically relevant extent. The peak plasma levels (Cmax) and the area under the curve (AUC) of clobazam are dose-proportional over the dose range of 10-80 mg following single- or multiple-dose administration of ONFI. Based on a population pharmacokinetic analysis, the pharmacokinetics of clobazam are linear from 5-160 mg/day. Clobazam is converted to N-desmethylclobazam which has about 1/5 the activity of clobazam. The estimated mean elimination half-lives (t1/2) of clobazam and N-desmethylclobazam were 36-42 hours and 71-82 hours, respectively. Clobazam is rapidly and extensively absorbed following oral administration. The time to peak concentrations (Tmax) of clobazam tablets under fasted conditions ranged from 0.5 to 4 hours after single- or multiple-dose administrations. The relative bioavailability of clobazam tablets compared to an oral solution is approximately 100%. After single dose administration of the oral suspension under fasted conditions, the Tmax ranged from 0.5 to 2 hours. Based on exposure (Cmax and AUC) of clobazam, ONFI tablets and suspension were shown to have similar bioavailability under fasted conditions. The administration of ONFI tablets with food or when crushed in applesauce does not affect absorption. Although not studied, the oral bioavailability of the oral suspension is unlikely to be affected under fed conditions. Clobazam is lipophilic and distributes rapidly throughout the body. The apparent volume of distribution at steady state was approximately 100 L. The in vitro plasma protein binding of clobazam and N-desmethylclobazam is approximately 80-90% and 70%, respectively. Clobazam is extensively metabolized in the liver, with approximately 2% of the dose recovered in urine and 1% in feces as unchanged drug. The major metabolic pathway of clobazam involves N-demethylation, primarily by CYP3A4 and to a lesser extent by CYP2C19 and CYP2B6. N-desmethylclobazam, an active metabolite, is the major circulating metabolite in humans, and at therapeutic doses, plasma concentrations are 3-5 times higher than those of the parent compound. Based on animal and in vitro receptor binding data, estimates of the relative potency of N-desmethylclobazam compared to parent compound range from 1/5 to equal potency. N-desmethylclobazam is extensively metabolized, mainly by CYP2C19. N-desmethylclobazam and its metabolites comprise ~94% of the total drug-related components in urine. Following a single oral dose of radiolabeled drug, approximately 11% of the dose was excreted in the feces and approximately 82% was excreted in the urine. The effect of renal impairment on the pharmacokinetics of clobazam was evaluated in patients with mild (creatinine clearance [CLCR] >50 to 80 mL/min; N=6) and moderate (CLCR=30 to 50 mL/min; N=6) renal dysfunction, with matching healthy controls (N=6), following administration of multiple doses of ONFI 20 mg/day. There were insignificant changes in Cmax (3-24%) and AUC (≤13%) for clobazam or N-desmethylclobazam in patients with mild or moderate renal impairment compared to patients with normal renal function. Patients with severe renal impairment or ESRD were not included in this study. There are limited data to characterize the effect of hepatic impairment on the pharmacokinetics of clobazam. In a small study, the pharmacokinetics of a 20 mg single oral dose of ONFI in 9 patients with liver impairment were compared to healthy controls (N=6). The Cmax and the mean plasma clearance of clobazam, as well as the Cmax of N-desmethylclobazam, showed no significant change compared to the healthy controls. The AUC values of N-desmethylclobazam in these patients were not available. Adjust dosage in patients with hepatic impairment [see Dosage and Administration (2.7)]. The effect of repeated 40 mg once-daily doses of ONFI on the pharmacokinetic profiles of single-dose dextromethorphan (CYP2D6 substrate), midazolam (CYP3A4 substrate), caffeine (CYP1A2 substrate), and tolbutamide (CYP2C9 substrate), was studied when these probe substrates were given as a drug cocktail (N=18). Clobazam increased AUC and Cmax of dextromethorphan by 90% and 59%, respectively, reflecting its inhibition of CYP2D6 in vivo. Drugs metabolized by CYP2D6 may require dose adjustment when used with ONFI. Clobazam decreased the AUC and Cmax of midazolam by 27% and 24%, respectively, and increased the AUC and Cmax of the metabolite 1-hydroxymidazolam by 4-fold and 2-fold, respectively. This level of induction does not call for dosage adjustment of drugs that are primarily metabolized by CYP3A4 when used concomitantly with ONFI. Some hormonal contraceptives are metabolized by CYP3A4 and their effectiveness may be diminished when given with ONFI [see Drug Interactions (7.3)]. Repeated ONFI doses had no effect on caffeine and tolbutamide. Strong (e.g., fluconazole, fluvoxamine, ticlopidine) and moderate (e.g., omeprazole) inhibitors of CYP2C19 may result in up to a 5-fold increase in exposure to N-desmethylclobazam, the active metabolite of clobazam, based on extrapolation from pharmacogenomic data [see Clinical Pharmacology (12.5)]. Dosage adjustment of ONFI may be necessary when co-administered with strong or moderate CYP2C19 inhibitors [see Drug Interactions (7.4)]. Alcohol has been reported to increase the maximum plasma exposure of clobazam by approximately 50%. Alcohol may have additive CNS depressant effects when taken with ONFI [see Warnings and Precautions (5.2), Drug Interactions (7.2)]. The polymorphic CYP2C19 is the main enzyme that metabolizes the pharmacologically active N-desmethylclobazam. Compared to CYP2C19 extensive metabolizers, N-desmethylclobazam AUC and Cmax are approximately 3-5 times higher in poor metabolizers (e.g., subjects with *2/*2 genotype) and 2 times higher in intermediate metabolizers (e.g., subjects with *1/*2 genotype). The prevalence of CYP2C19 poor metabolism differs depending on racial/ethnic background. Dosage in patients who are known CYP2C19 poor metabolizers may need to be adjusted [see Dosage and Administration (2.5)]. In a fertility study in which clobazam (50, 350, or 750 mg/kg/day, corresponding to 12, 84 and 181 times the oral Maximum Recommended Human Dose, MRHD, of 40 mg/day based on mg/m2 body surface) was orally administered to male and female rats prior to and during mating and continuing in females to gestation day 6, increases in abnormal sperm and pre-implantation loss were observed at the highest dose tested. The no-effect level for fertility and early embryonic development in rats was associated with plasma exposures (AUC) for clobazam and its major active metabolite, N-desmethylclobazam, less than those in humans at the maximum recommended human dose of 40 mg/day. The effectiveness of ONFI for the adjunctive treatment of seizures associated with Lennox-Gastaut syndrome was established in two multicenter controlled studies (Study 1 and Study 2). Both studies were similar in terms of disease characteristics and concomitant AED treatments. The most common concomitant AED treatments at baseline included: valproate, lamotrigine, levetiracetam, and topiramate. Study 1 (N=238) was a randomized, double-blind, placebo-controlled study consisting of a 4-week baseline period followed by a 3-week titration period and 12-week maintenance period. Patients age 2-54 years with a current or prior diagnosis of LGS were stratified into 2 weight groups (12.5 kg to ≤30 kg or >30 kg) and then randomized to placebo or one of three target maintenance doses of ONFI according to Table 5. The pre-dosing baseline mean weekly drop seizure frequency was 98, 100, 61, and 105 for the placebo, low-, medium-, and high-dose groups, respectively. 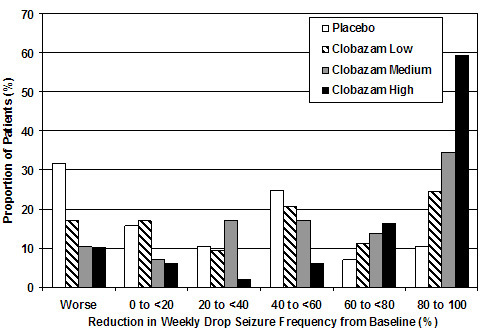 Figure 1 presents the mean percent reduction in weekly drop seizures from this baseline. 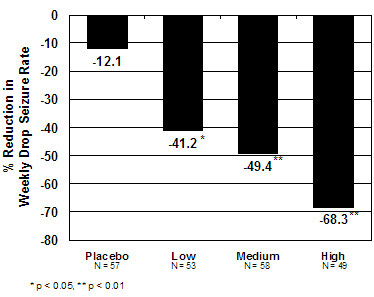 All dose groups of ONFI were statistically superior (p≤0.05) to the placebo group. This effect appeared to be dose dependent. Figure 2 shows changes from baseline in weekly drop seizure frequency by category for patients treated with ONFI and placebo in Study 1. Patients in whom the seizure frequency increased are shown at left as "worse." Patients in whom the seizure frequency decreased are shown in five categories. There was no evidence that tolerance to the therapeutic effect of ONFI developed during the 3-month maintenance period. Study 2 (N=68) was a randomized, double-blind comparison study of high- and low-dose ONFI, consisting of a 4-week baseline period followed by a 3-week titration period and 4-week maintenance period. Patients age 2-25 years with a current or prior diagnosis of LGS were stratified by weight, then randomized to either a low or high dose of ONFI, and then entered a 3-week titration period. Each ONFI tablet contains 10 mg or 20 mg of clobazam and is a white to off-white, oval tablet with a functional score on one side and either a "1" and "0" or a "2" and "0" debossed on the other side. ONFI oral suspension is a berry flavored off-white liquid supplied in a bottle with child-resistant closure. The oral suspension is packaged with a dispenser set which contains two calibrated oral dosing syringes and a bottle adapter. Store and dispense ONFI oral suspension in its original bottle in an upright position. Use within 90 days of first opening the bottle, then discard any remainder. NDC 67386-313-21: 2.5 mg/mL supplied in a bottle containing 120 mL of suspension. Store tablets and oral suspension at 20°C to 25°C (68°F to 77°F). See USP controlled room temperature. Inform patients and caregivers that potentially fatal additive effects may occur if ONFI is used with opioids and not to use such drugs concomitantly unless supervised by a healthcare provider [see Warnings and Precautions (5.1), Drug Interactions (7.1)]. Advise patients or caregivers to check with their healthcare provider before ONFI is taken with other CNS depressants such as other benzodiazepines, opioids, tricyclic antidepressants, sedating antihistamines, or alcohol [see Warnings and Precautions (5.2, 5.3)]. If applicable, caution patients about operating hazardous machinery, including automobiles, until they are reasonably certain that ONFI does not affect them adversely (e.g., impair judgment, thinking or motor skills). Inform patients or caregivers to consult their healthcare provider before increasing the ONFI dose or abruptly discontinuing ONFI. Advise patients or caregivers that abrupt withdrawal of AEDs may increase their risk of seizure [see Dosage and Administration (2.2), Warnings and Precautions (5.4)]. Inform patients or caregivers that ONFI is contraindicated in patients with a history of hypersensitivity to the drug or its ingredients [see Warnings and Precautions (5.5)]. Counsel women to also use non-hormonal methods of contraception when ONFI is used with hormonal contraceptives and to continue these alternative methods for 28 days after discontinuing ONFI to ensure contraceptive reliability [see Drug Interactions (7.3), Clinical Pharmacology (12.3)]. Advise patients or caregivers that serious skin reactions have been reported in patients taking ONFI. Serious skin reactions, including SJS/TEN, may need to be treated in a hospital and may be life-threatening. If a skin reaction occurs while taking ONFI, patients or caregivers should consult with healthcare providers immediately [see Warnings and Precautions (5.5)]. Counsel patients, their caregivers, and their families that AEDs, including ONFI, may increase the risk of suicidal thoughts and behavior and advise them of the need to be alert for the emergence or worsening of symptoms of depression, any unusual changes in mood or behavior, or the emergence of suicidal thoughts, behavior, or thoughts of self-harm. Patients should report behaviors of concern immediately to healthcare providers [see Warnings and Precautions (5.7)]. Counsel patients that ONFI is excreted in breast milk. Instruct patients to notify their physician if they are breast feeding or intend to breast feed during therapy and counsel nursing mothers to observe their infants for poor sucking and somnolence [see Use in Specific Populations (8.2)]. Oral suspension manufactured by: Rosemont Pharmaceuticals, Ltd.
Leeds, West Yorkshire LS11 9XE, U.K.
What is the most important information I should know about ONFI? Do not stop taking ONFI without first talking to your healthcare provider. Stopping ONFI suddenly can cause serious side effects. ONFI can make you sleepy or dizzy and can slow your thinking and motor skills. This may get better over time. Do not drive, operate heavy machinery, or do other dangerous activities until you know how ONFI affects you. ONFI may cause problems with your coordination, especially when you are walking or picking things up. Do not drink alcohol or take other drugs that may make you sleepy or dizzy while taking ONFI until you talk to your healthcare provider. When taken with alcohol or drugs that cause sleepiness or dizziness, ONFI may make your sleepiness or dizziness much worse. ONFI can cause withdrawal symptoms. Do not stop taking ONFI all of a sudden without first talking to a healthcare provider. Stopping ONFI suddenly can cause seizures that will not stop (status epilepticus), hearing or seeing things that are not there (hallucinations), shaking, nervousness, and stomach and muscle cramps. Talk to your healthcare provider about slowly stopping ONFI to avoid withdrawal symptoms. ONFI can be abused and cause dependence. ONFI is a federally controlled substance (CIV) because it can be abused or lead to dependence. Keep ONFI in a safe place to prevent misuse and abuse. Selling or giving away ONFI may harm others, and is against the law. Tell your healthcare provider if you have ever abused or been dependent on alcohol, prescription medicines or street drugs. Serious skin reactions have been seen when ONFI is taken with other medicines and may require stopping its use. Do not stop taking ONFI without first talking to your healthcare provider. A serious skin reaction can happen at any time during your treatment with ONFI, but is more likely to happen within the first 8 weeks of treatment. These skin reactions may need to be treated right away. Like other antiepileptic drugs, ONFI may cause suicidal thoughts or actions in a very small number of people, about 1 in 500. ONFI is a prescription medicine used along with other medicines to treat seizures associated with Lennox-Gastaut syndrome in people 2 years of age or older. It is not known if ONFI is safe and effective in children less than 2 years old. are allergic to clobazam or any of the ingredients in ONFI. See the end of this Medication Guide for a complete list of ingredients in ONFI. use birth control medicine. ONFI may cause your birth control medicine to be less effective. Talk to your healthcare provider about the best birth control method to use. are pregnant or plan to become pregnant. ONFI may harm your unborn baby. Tell your healthcare provider right away if you become pregnant while taking ONFI. You and your healthcare provider will decide if you should take ONFI while you are pregnant. Babies born to mothers receiving benzodiazepine medications (including ONFI) late in pregnancy may be at some risk of experiencing breathing problems, feeding problems, dangerously low body temperature, and withdrawal symptoms. If you become pregnant while taking ONFI, talk to your healthcare provider about registering with the North American Antiepileptic Drug Pregnancy Registry. You can register by calling 1-888-233-2334. For more information about the registry go to http://www.aedpregnancyregistry.org. The purpose of this registry is to collect information about the safety of antiepileptic drugs during pregnancy. ONFI can pass into breast milk. Talk to your healthcare provider about the best way to feed your baby if you take ONFI. You and your healthcare provider should decide if you will take ONFI or breast feed. You should not do both. Tell your healthcare provider about all the medicines you take, including prescription and over-the-counter medicines, vitamins, and herbal supplements. Taking ONFI with certain other medicines can cause side effects or affect how well ONFI or the other medicines work. Do not start or stop other medicines without talking to your healthcare provider. Take ONFI exactly as your healthcare provider tells you to take it. Your healthcare provider will tell you how much ONFI to take and when to take it. ONFI tablets can be taken whole, broken in half along the score, or crushed and mixed in applesauce. ONFI tablets and oral suspension can be taken with or without food. Shake the bottle of ONFI oral suspension well right before you take each dose. 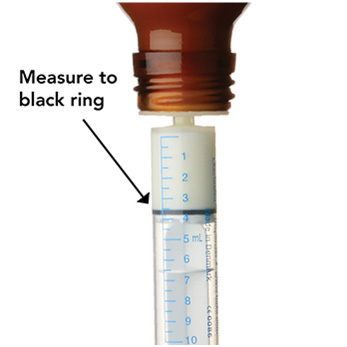 Measure your dose of ONFI oral suspension using the bottle adapter and dosing syringes that come with your ONFI oral suspension. 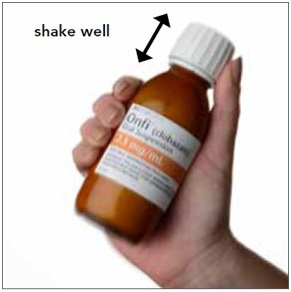 Read the Instructions for Use at the end of this Medication Guide for information on the right way to use ONFI oral suspension. Your healthcare provider may change your dose if needed. Do not change your dose of ONFI without talking to your healthcare provider. Do not stop taking ONFI without first talking to your healthcare provider. Stopping ONFI suddenly can cause serious problems. If you take too much ONFI, call your healthcare provider or go to the nearest hospital emergency room right away. Do not drink alcohol or take other medicines that may make you sleepy or dizzy while taking ONFI until you talk to your healthcare provider. When taken with alcohol or medicines that cause sleepiness or dizziness, ONFI may make your sleepiness or dizziness much worse. What are the possible side effects of ONFI? ONFI may cause serious side effects, including: See "What is the most important information I should know about ONFI?" These are not all the possible side effects of ONFI. Call your doctor for medical advice about side effects. You may report side effects to FDA at 1-800-FDA-1088. How should I store ONFI? Store ONFI tablets and oral suspension between 68°F to 77°F (20°C to 25°C). Keep ONFI tablets in a dry place. Replace the cap securely after opening. Store and dispense ONFI oral suspension in its original bottle in an upright position. Use ONFI oral suspension within 90 days of first opening the bottle. After 90 days safely throw away any ONFI oral suspension that has not been used. Keep ONFI and all medicines out of the reach of children. General Information about the safe and effective use of ONFI. Medicines are sometimes prescribed for purposes other than those listed in a Medication Guide. Do not use ONFI for a condition for which it was not prescribed. Do not give ONFI to other people, even if they have the same symptoms that you have. It may harm them. You can ask your pharmacist or healthcare provider for information about ONFI that is written for health professionals. What are the ingredients in ONFI? Inactive ingredients: modified corn starch, lactose monohydrate, magnesium stearate, silicon dioxide, and talc. Inactive ingredients: magnesium aluminum silicate, xanthan gum, citric acid monohydrate, disodium hydrogen phosphate dihydrate, simethicone emulsion, polysorbate 80, methylparaben, propylparaben, propylene glycol, sucralose, maltitol solution, berry flavor, purified water. Marketed by: Lundbeck, Deerfield, IL 60015, U.S.A.
Read this Instructions for Use before using ONFI oral suspension and each time you get a refill. There may be new information. This leaflet does not take the place of talking with your healthcare provider about your medical condition or treatment. Oral dosing syringe (2 dosing syringes are included in the ONFI oral suspension box). Use only 1 syringe to take your dose of ONFI oral suspension. If you lose or damage the syringe, or cannot read the markings, use the other syringe. Step 1. Remove the ONFI oral suspension bottle, bottle adapter, and 1 syringe from the box. Once the bottle adapter is in place, it should not be removed. 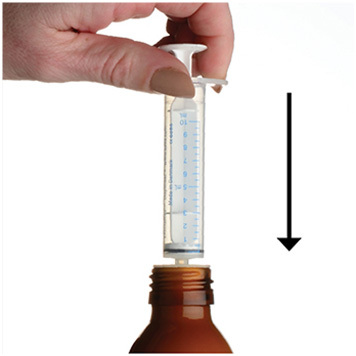 Store and dispense ONFI oral suspension in its original bottle in an upright position at 68°F to 77°F (20°C to 25°C). Use ONFI oral suspension within 90 days of first opening bottle. Step 9. Wash the oral syringe after each use. To clean the oral syringe, take apart by removing the plunger completely. Pull plunger straight out of the barrel. The barrel and plunger can be washed with soap and water, rinsed, and allowed to dry. Do not wash the oral syringe in the dishwasher. DISPENSE THE ENCLOSED MEDICATION GUIDE WITH EACH PRESCRIPTION. DISPENSE THE ENCLOSED MEDICATION GUIDE AND INSTRUCTIONS FOR USE WITH EACH PRESCRIPTION.